Download the flyer for the 2010 Kinston Ace Race! This event is open to the first 25 players to sign up. You can pre-register here and reserve your place. We'll probably have several packs available the morning of the event. If we fill before the event, I'll post it here. 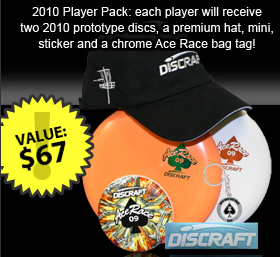 Player pack includes 2 Ace Race discs, Discraft hat, full-color mini and chrome Ace Race bag tag. Grand prize is a Discraft bag with 8 premium Discraft discs. This event is a lot of fun and a good event for players of all skill levels. The Ace Race is a 2-round event, where players take one throw at each hole, trying to make an ace. Players can only use the player pack Ace Race discs. Aces and metal hits are scored. This is not a "shotgun start" event, so as long as you start your first round by 11:00am, you can start when you want. Players packs will be limited, so pre-register or show up early. Pre-registration requires payment, and guarantees your player pack. We will have a random draw doubles round in the afternoon, at a time to be determined following the Ace Race awards. For more information, please contact Joel Smith. Online registration is now closed. Sign-in will open Saturday morning at 9:30am. For best selection of disc weights and hat colors, don't wait too long. If any unpaid registrations aren't signed in by 10:30am, we may have some player packs available on a first-come-first-served basis. Thanks for registering early. We look forward to seeing you in the morning! We will have 25 players pre-registered. We've pre-registered 25 players! Online registration is closed. Thanks! Don't forget random draw doubles Saturday afternoon - open to all players.